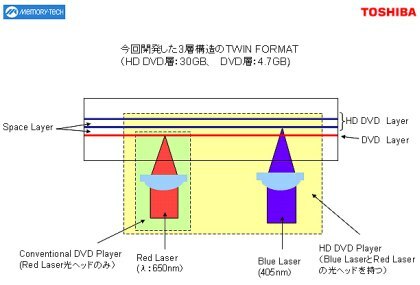 In order make HD DVD technology more appealing and offer better backward compatibility, Toshiba has introduced the three layer TWIN format Disc. The newly announced disc is the latest addition to the DVD TWIN format, discs that support both DVD and HD DVD content and that are fully compatible with both formats. The new disc boosts capacity and expands versatility with a three-layer structure offering support for two HD DVD layers and one DVD layer or two DVD layers and one HD DVD layer.